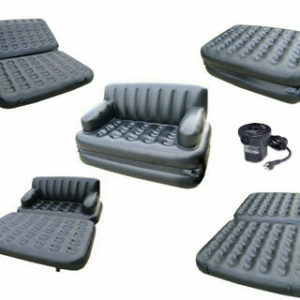 The Inflatable Ultra Double bed Lounge 68881 invites you to relax, soak up the sun and hang out with friends. It’s an elegant addition to any room, patio or yard as the reinforced bottom and soft flocking makes it versatile enough for both indoor & outdoor. Remember, the ultra day bed lounge 68881 is just as comfortable and strong as a regular mattress. Made from PVC Vinyl, it’s thicker than most standard air mattresses, plus you can choose how soft or firm you want it! When you’re finished, just deflate, roll up and store in the handy travel bag included.